It's the final day of Introductions and this one is designed by Elena Roussakis. 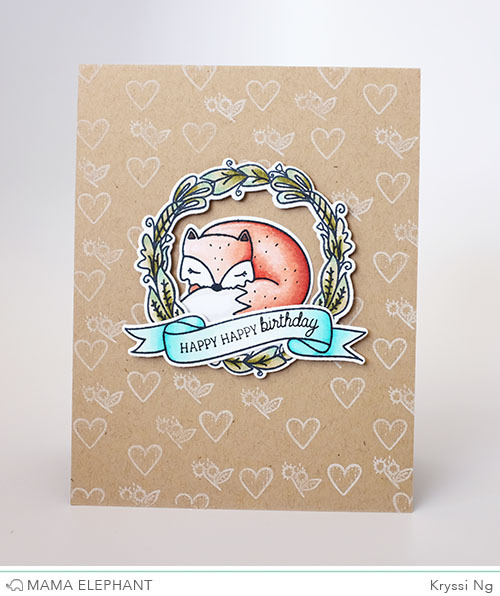 Elena really outdid herself with this one with the beautifully illustrated owl and sweet fox. The luscious wreath and cute little banner. 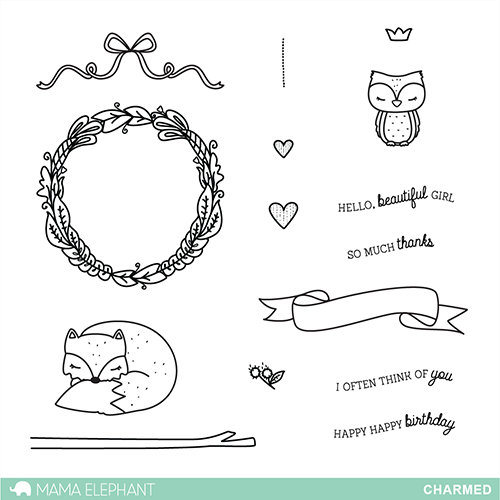 You've got all the elements to create a charming card! Here is what Elena has to say about the set. "I've always wanted to draw a sleeping fox, and this one turned out so charming, hee! 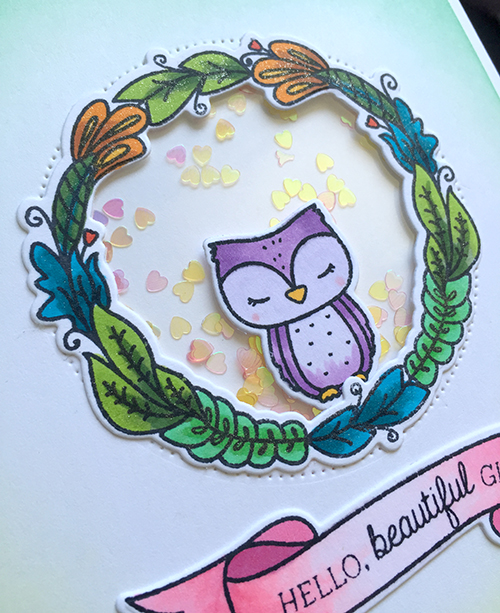 The leafy wreath is perfect for making woodland tags - fill it with your favorite critter (like the sweet owl with her soft eyelashes,) or with just the wavy banner and it is the perfect size for thank you tags, or for a focal point on a card. I hope you fall in love with the images I drew - I can't wait to see what the design team did with them!" The images really are quite beautiful and really dictates the design. You really can't go wrong with them... I created a white on kraft background here using one of little flower and textured heart. Nothing technical here, just random stamping. I went for a higher contrast coloring to really draw out the images to the eye... I love the results! 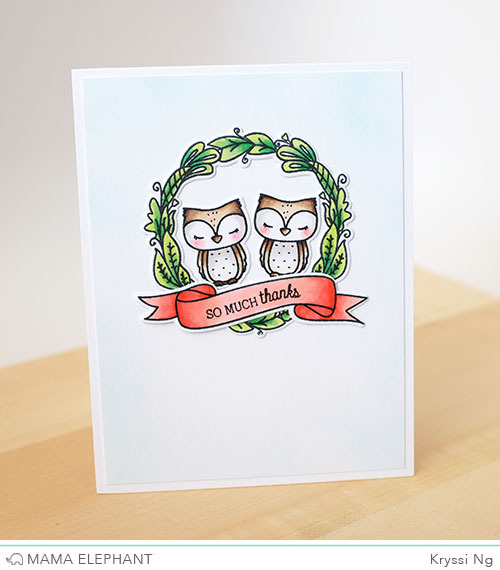 Here's pretty much the same card with a different cardstock base and using the sweet owls instead. Aren't they cute? 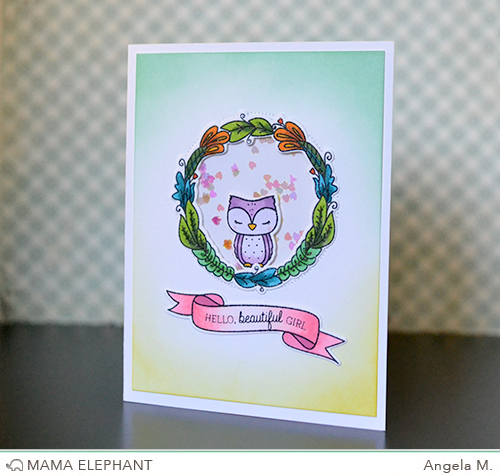 Angela couldn't help but to make another shaker card with this cute set! The circle die cut from Sew Fancy is perfect for the window. Thanks again for taking the time to stop by! The full formal reveal will be up tonight. Make sure to come back for the Stampede tomorrow! Oh this is so beautiful! Great cards, ladies! Lovely! This is my favorite set from the whole release! Love the fox in the wreath. the owl couple are darling. Absolutely gorgeous creations! Stinkin' cute! I think this will be my fave this release. So sweet! This set is absolutely adorable! Great job Elena! Really cute and very versatile! I love this stamp set because of the cute little fox and owl. I am glad that it comes with a birthday greeting and a little crown that you can put on top of the fox or owl.